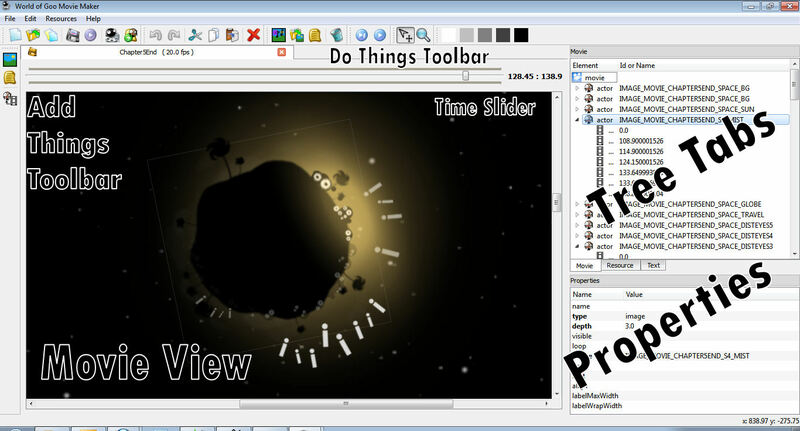 World of Goo Movie Editor (aka Goovie Maker) is a tool for making movies and animations. You can create your own movies using your own original graphics and music, or just tweak an movie from the original game - or anything in between. You will need to have purchased the full game. Windows Users, if you want to play your levels directly from the Editor (and you will want to), you also need to update to the latest version. The full Windows installation package is available from the download page. The first time you run World of Goo Movie Editor it will ask you to locate the WorldOfGoo folder you want to edit. The Movie View area is a Tabbed Multiple-Document Interface (MDI), so you can have several moviess open at once, and you can switch view as needed. This also means you can copy and paste things from one movie into another (described in more detail later). It will help you to create movies and find your way around if you have some understanding of how World of Goo (and hence the Editor) structures the movie data. 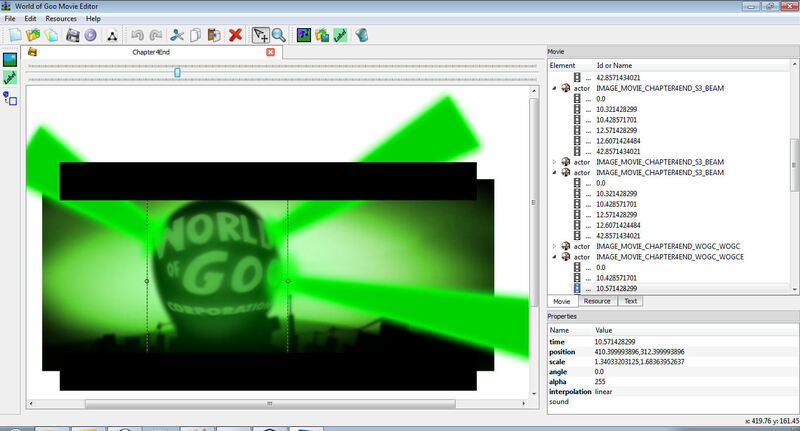 World of Goo plays a movie from a movie.binltl file (encoded binary) and a single resource XML file. The Editor uses an additional movie.xml file to store the movie information in "human-readable" form. The XML files for a movie are called Movie and Resources (resrc). Holds information about the actors (images and text) in a movie, and keyframe information for each which controls what they do and how they move and appear. Holds a list of all the image and sound files used in the movie and gives each one an ID. This ID is then used to apply images/sounds to items in the level, rather than using their actual filename. Each of these files is represented as a Tree View in the Tree Tabs panel. The tree begins at the top with a "root" item: movie or resources. All the objects in that file are listed as children underneath the root item. Open Image. Some of these you can also change using your mouse (position, size, and rotation) by selecting and dragging objects in the level view. Others you will have to enter or select by hand in the properties pane.